Through this integration, Magento merchants can easily incorporate Amazon Pay into their site, reduce friction at checkout and reach Amazon customers who have come to value this trusted, familiar Amazon buying experience. For today’s online shoppers, a speedy checkout experience—especially one that’s optimised for mobile devices—can make a profound difference. More than a quarter of online purchases are now made using mobile devices¹. Yet the average mobile shopping cart abandonment rate remains above 50%². One reason for this is a slow and complicated checkout experience. According to one study, 25% of mobile device users who didn’t complete their purchases say the checkout process took too long³. In the current environment, it’s more important than ever to streamline the checkout experience—and Magento has teamed up with Amazon Pay to help merchants do exactly that. Merchants can easily integrate Amazon Pay into their powerful Magento -based website, enabling customers to pay using the credentials already stored in their Amazon account. The result is a fast, familiar, and secure payment process for customers shopping from both desktop and mobile devices. For merchants using Amazon Pay with Magento, the successes have been impressive. For example, UK-based online retailer DOMU sells stylish and functional kitchen, garden and homeware appliances—both on and off Amazon. The company built its site on the Magento eCommerce platform, integrating Amazon Pay to simplify the checkout experience and reduce cart abandonments. By cutting the checkout process to just three clicks with Amazon Pay, DOMU shoppers can now complete purchases in less than a minute. For DOMU, Amazon Pay was easy to integrate with Magento, and its seamless operation from several devices has enhanced the multi-channel shopping experience. After the first month of adding Amazon Pay to its site, overall customer transactions increased by 41%, with conversions skyrocketing across the board. Desktop conversions increased by 26%, and tablet conversions grew by 38%. Most notably, mobile conversions grew by an astounding 50%. As with DOMU, Amazon Pay with Magento has helped U.S. retailer Shinola dramatically improve the customer experience. A company that builds watches, bicycles, journals, jewelry, leather goods, and high quality turntables, Shinola launched its online site through Magento’s eCommerce platform and eventually integrated Amazon Pay to eliminate friction during checkout. Amazon Pay on Magento is also a significant growth factor for Flooring Superstore. The leading online flooring specialist in the UK, Flooring Superstore offers high-quality flooring from carpet to vinyl and even artificial grass. While the company has experienced rapid growth, one challenge was convincing consumers to purchase flooring online rather than visiting a store. To provide its customers with a smooth shopping experience, Flooring Superstore built its business on the Magento eCommerce platform, adding Amazon Pay as a payment option. Within two months of introducing Amazon Pay, conversion rates rose 44%. Part of that increase in conversions is from mobile shoppers, who now account for nearly 70% of customers. We've seen a massive shift from desktop to mobile. 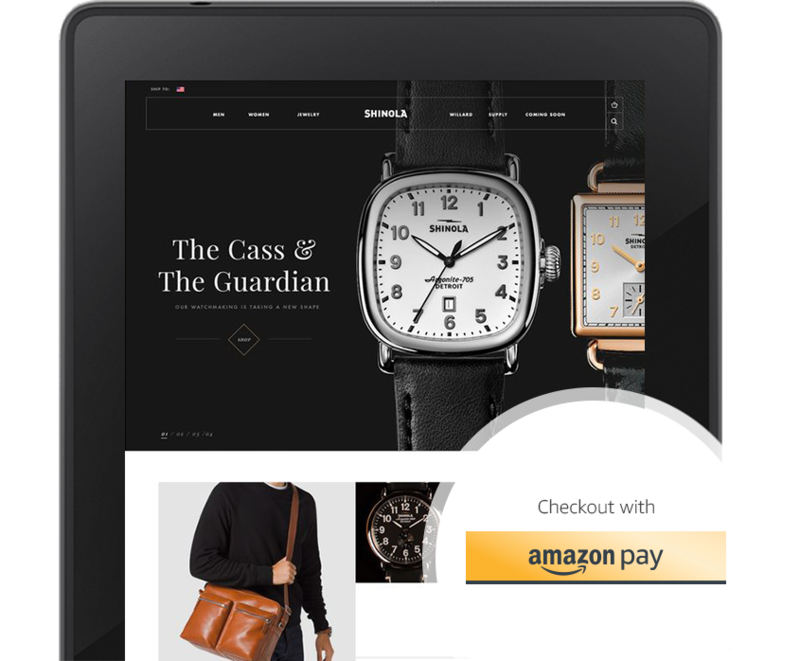 Amazon Pay has made the mobile experience seamless. Amazon Pay on Magento can help merchants meet customer expectations for a quick and trusted buying experience optimized for today’s mobile shoppers. It’s fast, easy and secure—helping merchants to add new customers and increase sales.